On Thursday June 16th Madelyn Hoffman, Ron DeStefano, Sandy Shevak, Susan Krcmar and I went to Representative Pascrell’s office for a Meeting on Exiting Afghanistan organized by Credo. The objective of the meeting was to urge Rep. Pascrell to Co-sponsor Barbara Lee’s “Responsible End to the War in Afghanistan Act” (H.R. 780). Despite early optimism left over from the outcomes of our meetings with staff in Senator Lautenberg and Senator Menendez’s offices, the meeting ended up being a let down. We met with Assad R. Akhter, the Deputy Chief of Staff in Representative Bill Pascrell’s office. What we heard from him was that Representative Pascrell believes that progress is being made in Afghanistan because 2 million Afghan children are being educated, and that he trusts President Obama and his advisors to make the best decision. We also had to hold tight to our patience as Mr. Akhter paid more attention to his blackberry than to us, and left the room to take a 5 minute phone call in the middle of the meeting. We are in the midst of the economic crisis, cuts to various community programs, and the continuation of wars that most Americans do not want. Despite this, Representative Pascrell has chosen not to support HR780. In my opinion, since Rep. Pascrell has been able to ignore the changing opinions on these issues and the needs of his constituents, it is not surprising that the five of us were not able to change his aide’s mind. Nevertheless, it was disappointing that we were not taken more seriously. But we have seen that with enough pressure from their constituents, politicians can, and do change their minds. Please help us to urge our Representatives to co-sponsor HR 780 and an expedited withdrawal of troops from Afghanistan. If you live in District 8 please call Representative Pascrell. Representative Pascrell’s phone number in Washington, D.C. is 202-225-5751. His local phone number in Paterson is 973-523-5152. If you live in District 9 please call Representative Rothman. You can reach Representative Rothman at 201-646-0808 in Hackensack or 202-225-5061 in Washington, D.C. If your representative is not on this list, please call them and urge them to do so. 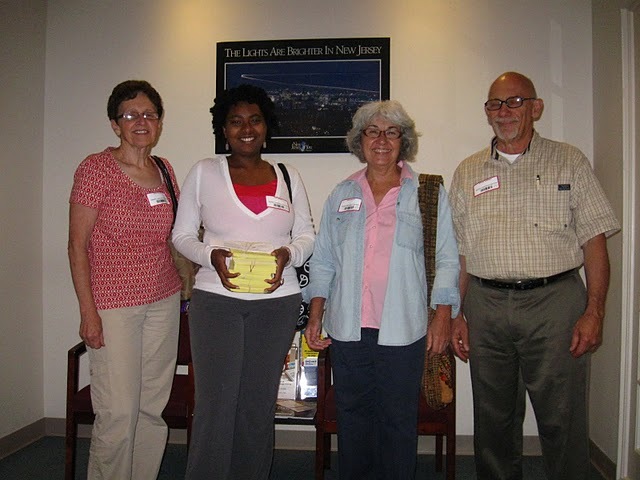 On June 1st I saw the documentary “Postergirl” with Madelyn Hoffman and Denicknel, another NJPA volunteer. Going in I knew next to nothing about the movie, except that it was about a veteran with Post-Traumatic Stress Disorder. While there are many messages to take away from this movie, not the least being that these wars should have ended before they began, my thoughts have stayed with Robynn Murray, the ‘postergirl’ and her experiences after returning to the U.S. This movie got me thinking about powerful women and what I feel is a responsibility for those with power to use that power to help others. Now, I understand that this was a child, but apparently grown adults feel the same way, that the dearth of women in the government means we should support any woman, regardless of whether she is qualified or not. I remember hearing that several times as a rationale for supporting Hillary Clinton over Barack Obama in the Democratic primaries. Women who reach high levels in the government have more influence on a large scale than the average American woman and can use their influence to advocate for the issues they support. But what about the entertainers? Recently Beyonce made a video for her song called ‘Who Run the World (Girls).’ On YouTube vlogger (video blogger) Glozell made the first criticism of the video that I saw. She said she was expecting something like a tribute to powerful women in the world, not a bunch of partially-dressed women dancing like in most other music videos every popular artist has been making. And vlogger nineteenpercent made the point in a longer video that people continue to deny any inequality for women despite the fact that most sexual assault victims and domestic assault victims are women, that women are disrespected at work, at home, in the media and entertainment. And yet, Beyonce can make a video that claims that girls run the world, which in its title and content demonstrate that very inequality. But why would we expect anything else? So few popular, powerful rich artists use that power to try to challenge the problems in the world. But there are some who do. Meryl Streep, Tracy Chapman, and Susan Sarandon have gotten involved in various social issues. And there are many everyday women who do their part to improve the world, without getting as much recognition. I believe that those who are given power by everyday people, like our elected officials, have a responsibility to do what those who elected them want. I believe that those who are given power by everyday people, like our entertainers, have a responsibility to speak out for their fans and tell the truth about the issues facing them. Obviously it is possible to do that and still be popular and successful. So what is stopping them from speaking up? Which leads me back to Robynn Murray. I do not know her goals for the future, how she feels about various other social justice issues, but I do know that she is one woman who is fighting for what she believes in. After joining the Army and serving in Iraq she has struggled with Post-Traumatic Stress Disorder and subsequent mistreatment at the hands of her doctors. She says she was chosen as the “postergirl” because she was a ‘good soldier’ because she could ‘shut-up and take it’, it being the pressures and sexual harassment that come with being a women in the military. She was put in a position of power and she was taught by the U.S. military that it was okay to point a gun at the Iraqi people because they were less than human. But Robynn has learned from her experience. She says she wants to apologize to all those people who were traumatized by looking into the barrel of her gun. Now she is involved in several veterans’ affairs groups, speaking out about what she went through, what is still happening to other soldiers. This is no easy task, but she is putting herself out there for that she believes in, and trying to heal from scars that are more than just physical. She isn’t an Oscar winning actress or an internationally known singer, but in my book, Robynn Murray is one powerful woman. Don’t forget to comment and let us know what you think about the movie! My next door neighbor in my dorm this past year had this Golden Rule poster on her door. There are many different versions of the Golden Rule, but for me as a Christian this is “do unto others as you would have them do unto you.” Many people, myself included, heard this over and over growing up, at school, at home, in church, etc. But how closely do we follow this common saying? Here’s the thing. We all have groups that we identify with proudly, but no one likes to be judged as a member of a group if it has a bad connotation and no one wants to hear their group disparaged. Also, no one wants to be judged by some members of the group with whom they disagree. Personally, I think Christianity is a wonderful religion, and I am proud to follow Christian principles. However, I don’t want everyone who knows that I am a Christian to look at people like Scott Lively, Caleb Lee Brundidge and Don Schmierer, three men who spoke at a conference in Uganda about “curing” homosexuals and helped set in motion the Anti-Homosexuality Bill of 2009, which includes the death penalty for homosexuality, and think that all Christians are heterosexist and homophobic. I don’t want anyone to look at Michelle Bachmann, a Christian who has said “not all cultures are equal, not all values are equal,” about Islam and think all Christians feel the same way. I don’t want anyone to see her support for the Center for Security Policy report, “Shariah: the Threat to America” which proposes that U.S. Muslims are waging a “stealth jihad” to impose sharia on the U.S. and think that all Christians are guilty of the same illogical thinking and constantly spouting the same kinds of ridiculous accusations and Islamophobia that politicians have used over and over to demonize those they disagree with. I don’t want anyone to look at Glenn Beck and think that all Christians are racist, sexist, and against equal rights for everyone but themselves and those that believe the things they do. And then, of course, there is Adolf Hitler. How often when we talk about the Holocaust do we mention that Hitler was a Christian? Do I even need to explain why I don’t want people to judge me by him? Basically, I just want to be judged by me, Jewel Daniels, my behavior and only my behavior, and I believe most people, if not all, want the same. And yet, many people do that very same, unjust thing to Muslims. A American value is individuality, yet we do not judge others as individuals when it suits us, when we are angry or afraid. Following that instinct is taking the easy way out, something we do much too often. Of course I have heard stories personally from friends and acquaintances about being called a terrorist and getting nasty looks from complete strangers, but this is happening all over the country. Currently, Muslims report rising discrimination at work. Muslims make up less than 2 percent of the United States population, but accounted for about one-quarter of the 3,386 religious discrimination claims filed with the Equal Employment Opportunity Commission in 2009. And then of course there was the Sikh taxi driver who in early June was beaten when one of his customers thought he was Muslim because he wore a turban. It was philosopher George Santayana who said ‘Those who cannot remember the past are condemned to repeat it’. I find this to be extremely appropriate for the situation we find ourselves in today. This same thing has happened over and over again in America. So few people have taken it to heart and stood up for others after having been themselves the ones who were discriminated against. Luckily, there are people who have chosen to remember their past and have empathy for others. Japanese Americans such as Representative Mike Honda have been among the most vocal and passionate supporters of Muslim Americans, especially on the West Coast. Honda spoke at a convention of the American Muslim Alliance in October 2001 expressing empathy for what they were experiencing due to his own family’s experience with Internment at Camp Apache during WWII. He defended Representative-elect Keith Ellison’s decision to use the Quran in his swearing-in ceremony and chastised Representative Virgil Goode in a letter for judging Ellison and other Muslims by the actions of radical extremists and urged him to embrace diversity, not fear it. Now here is someone who really follows the Golden Rule, and not just for Muslims, but for other minority groups in America fighting for equality. I know this is hard, but it is necessary. Be honest with me. Do you follow the golden rule? Do you stand up for what you believe in, and defend those wrongfully discriminated against? And if you don’t, isn’t it worth it to start? Susan, Jewel, Jo and Ron with the Move the Money Postcards! Tuesday, June 14th I got to see the offices of my U.S. Senators for the first time. To be honest, I had had no idea where they were, and I think most people probably do not either. They are in the Gateway Center, which I have been so close to so many times going to and from Newark. That got me thinking – how much attention does the average person really pay to what their representatives in the government are up to, unless there is some type of scandal? But that is another post for another day. I went with Madelyn Hoffman, Ron DeStefano, Susan Krcmar and Jo Sippie Gora to deliver a total of 1164 signed “Move the Money” postcards to the offices of Senator Frank Lautenberg and Senator Robert Menendez. New Jersey Peace Action has been working on this Move the Money campaign, calling for 25% of the Department of Defense budget to be cut in order to provide funds for community programs. Of course, more than 25 % would be even better, but we are trying to be realistic. Over the past few weeks I have seen the piles of postcards get bigger and bigger, heard requests of from 60 up to 700 of each postcard from various organizations, and seen them returned with signatures by everyone from College and Middle school students to Unitarian congregations to People’s Organization for Progress. This campaign is so amazing because practically everyone is united in this effort, to move the money from unnecessary Department of Defense (DOD) spending to schools, healthcare, veteran’s affairs and other community programs. When we went to their offices, both Senators were in Washington, so we were unable to meet with them in person. We went to Lautenberg’s office first, and spoke to Linda Barucky. I felt that she was not really listening, she is the NJ scheduler and she mentioned other people who would be better people for us to speak with, who unfortunately were not there at the time. Still, she promised to send the postcards to Lautenberg in Washington. Things went much better in Menendez’s office. We met with Betsy Gilligan the project coordinator and handler of constituent services, who was much more receptive to what we had to say. We each had our own perspective on why this was so important. Ron said we’re spending so much on the military, and so little on the green economy. Looking out this big window in the Senator’s office over the city of Newark, you don’t see a single solar panel. Green jobs would be a boost to the economy that we desperately need. Jo Sippie Gora mentioned the budget priorities banner which has been making the rounds of various peace vigils and peace organizations. This banner shows the percentages of the budget that go to every government program, from NASA to Education to the DOD. Big surprise, the DOD gets the largest cut of the pie, 59-60%. Jo said that if a family divided their money this way, they would be gone, unable to survive. You can’t spend most of your money on war and expect good to come out of it. You need to take care of the things you have, and invest in the future. As for me, I’ve been at college in Pennsylvania since August 2009 except for breaks which add up to a total of about 4 months. But when I come back, the roads are horrible with potholes everywhere, something I do not ever remember seeing as a child. I hear on facebook from friends still in Bloomfield about a cut in our library’s budget, and that the Northvale Public Library will no longer be a part of the inter-library loan system because of the loss of municipal funding. On the radio I hear about the layoff of over 160 police officers in Newark, and the 4 dead and 8 wounded in shootings in the next few days. It doesn’t take Einstein to see that we are destroying things our ancestors worked so hard to build. This country was far ahead of many others in terms of community programs, and now we are backsliding. Wednesday morning when I walked into the NJPA office, Ron had some great news. Senator Lautenberg said he will sign the Merkley-Lee-Udall letter. This letter urges President Obama to begin “a sizable and sustained reduction of U.S. military forces in Afghanistan”. As of June 14 this letter has the signatures of 27 Senators, including Senator Menendez and Lautenberg. When we went in yesterday, Lautenberg still had not signed the letter. I like to think that our petitions and postcards helped give him the push he needed to take that step. It’s really incredible to think that you personally had a hand in convincing a U.S. senator to support the reduction of US military forces in Afghanistan, but it shouldn’t be. As Ron reminded me, we pay them; they have to listen to us. So let’s make it abundantly clear what we want. Here is the Link to the “Connect the Dots Move the Money from War to Peace” page on the New Jersey Peace Action website. Here you will find all the information you need about supporting this campaign. There is information specific to each district about how much money is going to the Department of Defense, and how that money could be better spent. There are also postcards to each representative as well as Senator Frank Lautenberg and Senator Robert Menendez, asking them to help us move the money. Please sign the postcards, and send them to New Jersey Peace Action so we can send them in another large group this coming September or October, showing just how much support there is for this campaign. Don’t forget to share this with friends and family so they can sign as well. Over this past Winter break I read a book my friend Madelyn Hoffman gave me for Christmas. It was the Faith Club by Ranya Idliby, Suzanne Oliver and Priscilla Warner, three mothers, a Muslim a Christian and a Jew who came together to write a children’s book in the wake of the craziness of post 9/11 Islamophobia and ended up doing so much more than they set out to do. To be completely honest, I read it in less than three days, I couldn’t put it down. These three women met frequently, talking about their differences and commonalities, became friends, and later advocates for each other against those who disagreed with what they were doing. What these women were doing was so amazing for me to read about. Sure they had awkward moments, and argued about their personal as well as their religious beliefs, but they took that step on faith and challenged themselves to try to create a better world for their children. It sure didn’t sound easy, but it was a start and a whole lot more than most people were doing. A few weeks ago on Facebook, Americans Against Islamophobia posted an article about a request by Interfaith Alliance and Human Rights First to Christian churches “to invite Jewish and Muslim clergy to their sanctuaries to read from sacred texts next month in an initiative designed to counter anti-Muslim bigotry.” Another great idea! I hope this is not the first time anyone has come up with this idea, all I know is this is the first time I have heard of it. The only time I was asked to purposefully seek out and have a conversation with someone of different beliefs was this past semester in the Intercultural Communication class at Juniata College. I ended up spending a lot of time with an acquaintance in Juniata Hillel, my school’s Jewish club. There are people out there advocating for people to step outside their comfort zone and challenge their assumptions about others. Unfortunately they are not the loudest voices. Grassroots organizations, my classmates in Intercultural Communication and individuals like Ranya, Suzanne and Priscilla have taken steps toward communicating with others, rather than running away. But so much more needs to be done, especially by religious institutions, schools and of course the government. When we are willing to do that constantly rather than once in a blue moon, it will be that much easier to maintain peace and justice for everyone. What steps have you taken towards furthering thoughtful communication in your community, and as an individual? And what more needs to be done by the United States government and everyone in America? They say every generation has its defining moment. But as a 9-year-old, it felt like any other day. Ten years ago I was a chubby, bespectacled 5th grader, not a care in the world. My biggest worry was getting home in time for Pokemon. The words terrorist, Guantanamo Bay and al-Qaeda meant nothing to me. Ten years ago, September 11 2001, every class in my elementary school was gathered in the gymnasium. None of us had any idea that today, like when JFK was assassinated or when Pearl Harbor was bombed, would be the day that defined the rest of our lives. Ten years later, for another 9-year-old it was more special than just any other day; she was about to meet Representative Gabrielle Giffords at her first “Congress on Your Corner” gathering of the year in Casas Adobes, Tuscon Arizona. Christina-Taylor Green, was born 9/11/2001. Her mother says Christina’s birth “lent a grace note of hope to that terrible day.” She was an aspiring politician, a baseball player, and a caring daughter and sister. On January 8, 2011, Christina and 5 other people were murdered, and 14 others were wounded. Many Americans who believe that it is wrong to discriminate against others because of race, religion, age, ability or sexual orientation seem to have a huge blind spot as far as Islam is concerned. People equate Islam and Muslims with everything they hate and fear. After years of news about the “War on Terror” and hearing political leaders refer to “the Evildoers”, is it any wonder that people living through economic difficulties who blame President Obama for their hardships believe that the President is Muslim? This blind spot also extends to Latinos, but that was much more subtle until recently coming to the forefront of media attention in places such as Arizona. Now according to one of my professors, Latinos are now the people most often killed in movies and on tv. I have not seen any statistics, but it makes sense what with the growing anti-immigrant propaganda I have been hearing since middle school. In my sophomore year I joined my high school chapter of Amnesty International, and so began my crash course in American politics. I wasn’t expecting much in the way of changing the world, I was just there to learn. I wrote an article about Guantanamo Bay prison for a small newsletter we were going to print. As I sat in front of my computer staring at the AI website reading accounts of the abuse the prisoners suffered, I felt overwhelmed. What could one teenager do to change so much misery and hatred? That March our advisor brought us to the office of New Jersey Peace Action just two blocks away. 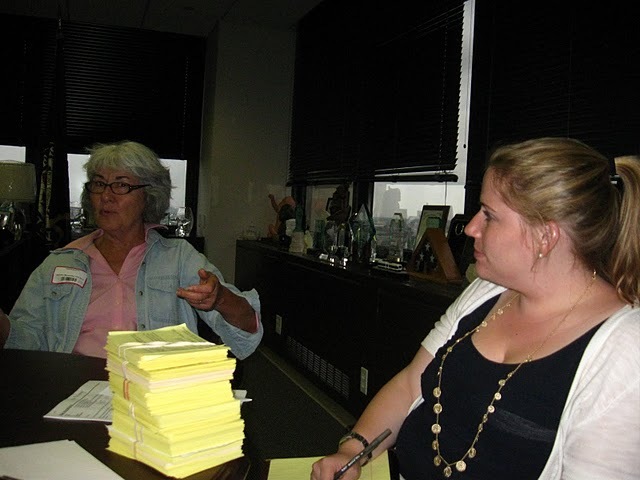 The Executive Director Madelyn Hoffman gave us a tour of the office and explained to us what NJPA was. I still felt like I knew next to nothing about any of these new issues that were popping up, but here was an office full of people who devoted their lives to peace, and if I was going to find answers, this was a good place to start. I started volunteering the next day, and at least once a week for the next few months I came and organized the dozens of books in their boutique. There was everything, not only the history of Peace Action but books about the Vietnam War, Hiroshima and Nagasaki, Star Wars and Nuclear Weapons in the United States. I had the information at my fingertips, but it was still going over my head. I continue to volunteer at New Jersey Peace Action to this day. Maybe someday this will all make sense, or maybe war, discrimination and hatred will always be a mystery to me. Regardless of the reasons politicians give, and the real reasons such as greed for money, oil or trade, I will never accept that people should die before we try every other option to maintain peace first. My senior year of high school I took AP government. I will never forget the day my teacher brought in that morning’s newspaper, in which was printed 4000 individual photos of Americans who had died in Iraq. All these young smiling faces, all these lives cut short. I do not understand the motivation to sign up for any branch of the armed forces, but the bravery of those who choose to do so deserves respect, respect that the United States government did not give them. Most Americans want this war to be over, yet more and more money is spent and more and more soldiers are sent overseas to die. Members of the government of the state of Arizona obviously do not respect the rights of people to live free of discrimination either. The Arizona Immigration Law SB1070 has become infamous. Representative Giffords like many others opposed this bill. She issued a statement saying “This law stands in direct contradiction to our past and, as a result, threatens our future.” The President of the University of Arizona contacted her when the families of several students who had planned on attending the University decided to attend out-of-state schools instead because they disagreed with this law. Another outcome is a loss of revenue for many businesses in Arizona near the US – Mexico border. Many Mexicans who frequently go to Arizona to shop have “trusted traveler” cards which enables them to save time crossing the border. the Mexican government issued a travel alert, warning of “a negative political environment for all Mexican visitors” in Arizona. After SB1070 was passed Mexican newspapers and radio stations labeled Arizona as xenophobic and Mexican-hating. Clearly people heeded the warning. In Nogales Arizona, business owners like Bruce Bracker suffered. He says that 80% of his business is from Mexican customers who cross legally and that “The day they signed the bill sales were down 50 percent, and since then I’ve been getting killed,”. You would think it’s obvious that writing a law that alienates people who spent nearly 4 billion dollars in your state every year is a bad idea. Clearly Arizona State Senator Russell Pearce, the author of SB1070, hasn’t gotten the memo. There is nothing wrong with having practical objections to this law, but for most people, their objections come from having a visceral reaction due to moral objections to the discrimination this bill legalizes. America has a very vivid history of discrimination, and of people who choose to fight it, yet it continues to this day. All across the country the responses have been intense. There was outrage and daily rants on facebook, people at my college decided to boycott Arizona and there are over two dozen Boycott Arizona facebook groups started by various individuals and organizations. I can only imagine how much more angry people directly affected in Arizona have been. Arizona is one of only three states, along with Alaska and Vermont where, as of April 2010, it is legal to carry concealed weapons without a permit. How could that possibly be a good idea in the middle of all this hatred boiling up to the surface? Angry people plus easy access to guns never equals anything good as Christina Green and Gabrielle Giffords can attest to. So where are we now? The wars in Iraq and Afghanistan and against people of color continue and more people die every day. Guantanamo Bay has not been closed, people in Arizona can be pulled over for having too much melanin in their skin, and a little girl, who brought her family hope in the middle of a national crisis, will never grow up to make her own mark on the world. I have learned a lot in the past ten years. I know how to form my own opinions on war, discrimination, guns and what it means to treat people like equals. I have come a long way from the confused 9-year-old. But let me ask you, what have you learned, and has America as a country learned anything?